There’s snow on the ground in New Jersey and Santa is trying to figure out what Graphic Novels can fit into stockings. Whether you celebrate Christmas, Hanukah, Kwanza, Winter Solstice or just really like sleeping in on those cold gray mornings, everyone here at ComiXpress wishes all of you a happy Holiday Season! I can’t believe that 2009 is already wrapping up. It’s been a heck of a year, and we’re looking forward to an even better 2010. To our Creators, Readers and Retailers, All the best from all of us! 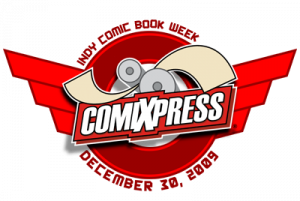 ComiXpress will be closed for the Holidays from December 24th through January 3rd, and will reopen on Monday January 4th. A small crew of diligent Elves will be on hand during the week to keep production from getting bogged down in tinsel, but Customer Service, PrePress and Billing will not be available until we return. Just wanted to update everyone that the equipment downtime we were experiencing last week is completely resolved and we’re back to full production. Thanks to everyone for their patience! We just wanted to let everyone know that we’re experiencing some downtime in our printing and binding schedules due to equipment being down. Our apologies for these unavoidable delays, and we expect to be running at full speed again shortly. Starting today, any Creator placing a new print order or reorder for their comic book or trade paperback will receive 10% off the books on that order! All you need to do is mention “Indy Comic Book Week” in your order form and your discount will be applied when your books are invoiced. There are no minimum orders, and this discount is available for any print order placed during the month of December, so yes a single Creator can take advantage of this offer multiple times if they place multiple print orders over the course of the month! Ship dates on these orders will be calculated based upon when the order is placed, so if you need books in-hand for Indy Comic Book Week itself, please allow for ship times and make sure your ship date is set correctly when you place your print order. Discounts apply to new orders placed during the month of December and cannot be applied retroactively, and can’t be combined with any other discount or special offers. And don’t forget to mention “Indy Comic Book Week” when you place your print order to get your discount! Back issues of Cerebus Archive as well as new issues as they come out are always available here at ComiXpress.